Norway’s Petter Solberg took a sensational lights-to-flag victory at today’s World RX of Canada to become the first driver to win a round of the FIA World Rallycross Championship presented by Monster Energy held outside of Europe. The PSRX driver also becomes the first double winner in RX this year. Volkswagen Marklund Motorsport’s Anton Marklund and Team Peugeot-Hansen’s Timur Timerzyanov finished second and third respectively, both drivers securing podium spots for the first time this season. Staged at the Trois Rivieres street circuit as part of the annual Grand Prix Trois-Rivieres (GP3R) motorsport festival, the seventh round of World RX attracted crowds of more than 30,000 people to watch 18 flame-spitting Supercars and nine RX Lites cars in the Intercontinental Cup. Three Canadian stars also helped draw a passionate home crowd as F1 World Champion Jacques Villeneuve, former IndyCar star Patrick Carpentier and multiple Canadian Rally Champion Antoine L’Estage took to the all-new RX circuit. Villeneuve was denied a place in the semi-finals after a fuel tank issue meant he was forced to withdraw but Carpentier wowed the crowds on his World RX debut, reaching the final and eventually finishing sixth. Two punctures for Reinis Nitiss proved costly for the Ford Olsbergs MSE driver who narrowly missed out on a semi-final spot after qualifying 13th at the end of the heats. However, retirement for Joni Wiman before the semi-finals opened the door for Nitiss, as first reserve, to enter the semi in which he finished third. Nitiss progressed to the final and eventually finished fourth but the lack of points gained from the heats means he drops behind VW Marklund’s Topi Heikkinen in the overall standings. Heikkinen rounded off the top five at RX Canada. 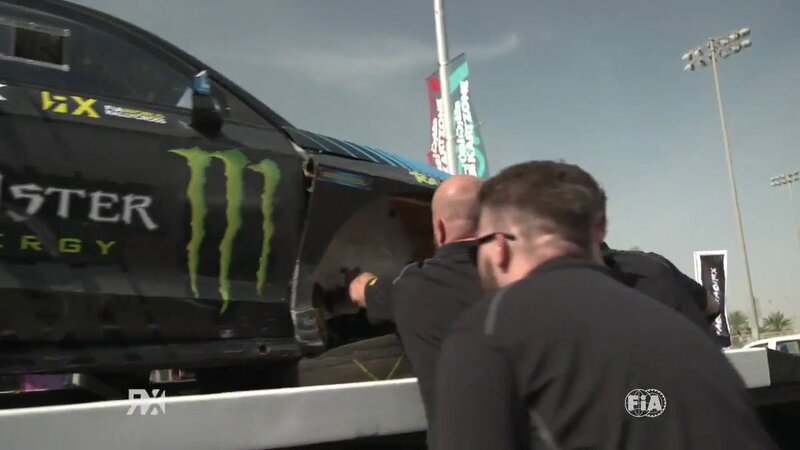 Monster Energy World RX Team’s Henning Solberg and Davy Jeanney both reached the semi-finals but a stall for Solberg on the start line saw the Norwegian denied a spot in the final. Jeanney was close to finishing in the top three in his semi but a final lap tussle saw the Frenchman lose out on the chance of reaching his first final this year. After two heat race wins Villeneuve was on course for a spot in the semis but a heavy landing wreaked havoc with the fuel tank on his Albatec Racing prepared Peugeot 208 Supercar and forced the French-Canadian to retire. Britain’s Andy Scott made the final 12 securing crucial points for the Scottish-based team. Vermont-based squad Subaru Rally Team USA impressed on its debut in World RX as three-time European Rallycross Champion Sverre Isachsen was on the pace throughout all four heats. The Norwegian reached the semis but finished fifth, one place behind Olsbergs MSE driver Andreas Bakkerud who also missed out on a spot in the all-important final. Round eight of the FIA World Rallycross Championship will return to European soil as the World RX crews prepare for the hugely popular French RX event which will be staged in Loheac from 6-7 September.